All across the country, park rangers are inviting Americans to start the New Year with an energizing First Day Hike. 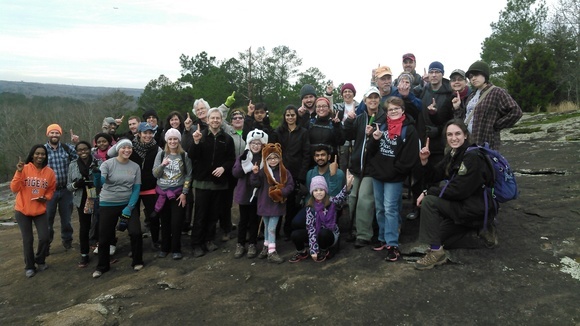 In Georgia’s State Parks and Historic Sites, dozens of guided treks will encourage friends and families to connect with nature and each other. First Day Hikes are part of a nationwide initiative from America’s State Parks to get people outdoors, with hundreds of hikes scheduled in all 50 states. Cabins, yurts and campsites are still available for New Year’s Eve as well. Find a hike near you. Enjoy a peaceful winter wonderland while saving on your wallet. This January, save 50% on campsites and 25% on yurts, Sunday through Thursday nights. We have RV and tent sites with hot showers, plus equestrian camping. Discount is valid for yurts, RV, tent and equestrian camping only (not groups). Not valid at Crooked River, Skidaway, Reed Bingham, Fort McAllister and Laura S. Walker state parks. Click "Go" for terms and conditions. Fort Mountain State Park near Chatsworth has newly renovated cottages now available. This park is in the middle of the north Georgia mountains, with exceptional trails for hiking, biking and horseback riding. You’ll find small streams, hardwood forests, a small lake and beautiful overlooks. You can even hike to the top of a 1930s fire tower for mountain vistas. Who doesn’t love a gorgeous view? Many of Georgia’s State Parks have trails and roads leading to some of the best vistas in the state. Winter can be an especially good time to visit because bare trees mean you’ll see farther into the landscape. At F.D. Roosevelt State Park in Pine Mountain, you can even pose for a photo with our nation’s 32nd president. Check out these parks with exceptional overlooks. Dreaming of upgrading to a fancy new RV? Come see our booth at Georgia’s largest all-indoor RV show. We’ll have 10% off RV camping discount coupons, the new “2017 Guide to Georgia State Parks & Historic Sites” and more goodies to give away. We can even help you pick new state parks to explore in 2017. January 14, 2017 10 a.m. – 3 p.m. Musicians from around the state will jam with traditional mountain dulcimers, fiddles, banjos, basses and harmonicas. If you have an instrument, please join in. If you simply want to listen, just come enjoy the music. Musicians will be teaching beginners on the instruments. All ages are welcome. $5 parking. 706-541-0321. January 29, 2017 1 p.m. Recycle your old t-shirts and turn them into a toy your dog will love. Bring two t-shirts and your furry friend. After toy making, we'll go on a dog pack hike along the river to enjoy the scenery. Dogs must be on a 6-foot leash at all times. Dress appropriately for the weather. Register in advance. Free treats! $5 per dog plus $5 parking. 770-254-7271. Ladies, enjoy golf for just $18 on Wednesdays at four Georgia State Park Courses: The Creek, Highland Walk, The Lakes and Brazell’s Creek. Hours vary by course. Call the individual courses for tee times.